MyLA311 Application Released for Mobile Phones! - Yo! Venice! Home Venice Beach California MyLA311 Application Released for Mobile Phones! MyLA311 Application Released for Mobile Phones! The City of LA has released their new (FREE!) 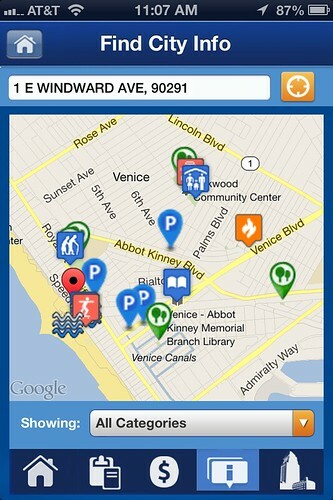 MyLA311 smart phone application and it is a “must have” for all Venice residents! As the application uses location services, reporting things such as graffiti, potholes, rubbish for removal and street lights that are out is now just a quick and easy “click” away! The application also lists all City Services near you on a handy map! With MyLA311 your email address and personal information is used only for the MyLA311 application and will not be sold or shared! No need to worry about shady 3rd parties getting your information just to get graffiti removed in Venice! All service requests can also be entered anonymously! After providing the service request details just leave the Contact Info fields blank prior to submitting your request. You can also use the “Skip and Submit” button to ignore the Contact Info contents and submit anonymously! Click here to download the application for iPhone. Click here to download the application for Android devices. MyLA311 also allows residents to pay Los Angeles Water and Power bills right from your mobile device!